Many dogs I go to see in a professional capacity have ‘phobias’ of one sort or another; quite a few have a collection. One that crops up repeatedly is ‘The Car.’ Some refuse to get in / bite anybody making them get in / bark / whine or cry the whole journey etc. When thought about from a dog’s point of view, the very first time they experience a car is when they are taken from their Dam (mother) and litter mates so are obviously stressed (bad association). The next time can be ‘Going to the Vets’ – being poked around and then given an injection (bad association). Many people also make the mistake of going too far too soon, making the dog physically sick then wondering why it is reluctant to travel (bad association). Any readers who have a similar problem, do not despair. There is always a way to help. Each problem needs a different solution. One dog in particular springs to mind; a really big German Shepherd called Bear. Initially he had problems meeting other dogs and needed a lot of work to get over this, so when he finally started being more sociable they started arranging every morning to meet on The Chevin at Otley everything went well initially and they were so pleased to get him meeting some mates and not wanting to eat them. However inadvertently, they then caused another problem; barking in the car. From the minute the engine started he just would not stop. The louder he barked, the faster they drove to get there so inadvertently they had caused the whole thing. So could this behaviour be changed, they asked. Of course it could, but it would require a plan, patience and persistence. It was the association of the car engine that was causing the problem, not the actual journey. All we had to do was work out a regime whereby he would go in the car consistently without getting the excitement. So for the immediate future they fed him in the car then took him back in the house or for a lead walk. Then we started increasing the time he stayed in and then started turning the engine on as well, and before long he would be ‘desensitised’ to the sound of the engine. We also mixed it up whereby he spent time in the car with a stuffed Kong then a walk at the end. Next were short journeys with the same procedure. The whole regime took several weeks with a few steps back to go forward, but the couple stuck at it and got a great result from a difficult situation. They had to remember not to have the same exciting routine, sometimes walking from the house, sometimes from the car, but not the same place over and over again. Any dog behaviour problem can be improved and will somewhere along the line involve desensitisation, reconditioning and better management. Summer is finally upon us, and again stories are in the media of dogs dying in cars because of the heat. There is not one valid excuse that can be given for anybody leaving a dog in a car when the temperature is high. I believe the problem, as with most things, is about education not blame. Most people do not want to inflict suffering on their pet but are just so naïve about the dangers. 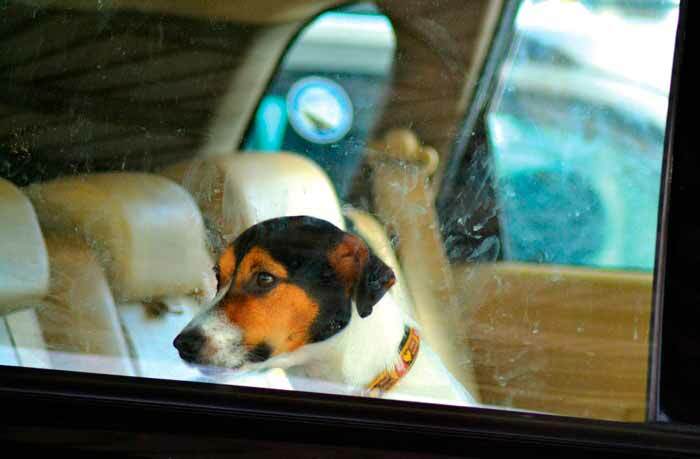 So what do we do if we see someone leave a dog in a car on a hot day? The best way is to be low-key and give the owner chance to remedy their mistake without feeling stupid. Try to come across as helpful rather than bossy. Diplomacy will work eventually if you are persistent but calm. Do not put yourself in danger by having an argument. If need be, get in touch with the RSPCA or dog warden. Sometimes just pointing out the temperature that can build up to in a car is enough. But if the dog is clearly in distress we have a duty to make sure something is done. At the time you may be unpopular but you will have done the dog and the owner a good turn. Many of the dogs we read about in the media who have died or suffered terribly could have been saved if someone had stood up for them or at least made the owner aware of the dangers.